Ulysses S. Grant led Union forces to victory over the Confederate Army of Northern Virginia in the Civil War and became President of the United States. 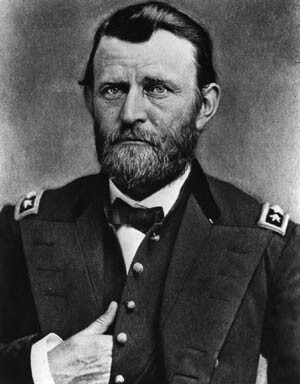 Born in Ohio in 1822, Ulysses S. Grant graduated from the United States Military Academy at West Point in 1843. He resigned from the U.S. Army in 1854 and struggled to find success, working as a farmer and bill collector. At the outbreak of the Civil War, Grant was working in the leather shop of his wife’s cousin in Galena, Ohio. Due to his military experience, Grant was asked to organize local units following President Abraham Lincoln’s call for volunteers for the Union Army. With the support of a friend in Congress, Elihu Washburne of Illinois, Grant received further command opportunities. Grant first achieved notoriety following the capture of Forts Henry and Donelson in Tennessee. Grant informed the Confederate commander at Fort Donelson, General Simon Bolivar Buckner, that only unconditional surrender was acceptable. The northern press seized upon the news, and Grant became famous as “Unconditional Surrender” Grant. In April 1862, Grant and his closest associate in the Union Army, General William T. Sherman, narrowly averted disaster on the first day and recovered to win a Union victory at the Battle of Shiloh. On July 4, 1863, Union forces under Grant won a significant victory with the surrender of the fortress city of Vicksburg, Mississippi, on the Mississippi River following a seven-week siege. That summer, Grant was elevated to command of all Union forces in the Western Theater except Louisiana. Within weeks, he resolved the crisis at Chattanooga, Tennessee, lifting the siege of Union troops there and routing the Confederate Army of Tennessee in a series of battles, opening the way for Sherman’s Atlanta campaign the following spring. By the spring of 1864, President Abraham Lincoln had promoted Grant to command of all Union armies in the field. Grant chose to command in the field, accompanying General George Meade’s Army of the Potomac in the decisive Virginia campaigns of 1864-1865. Grant realized the General Robert E. Lee and the Confederate Army of Northern Virginia were destined to lose a war of attrition. Despite setbacks, particularly at the Battle of Cold Harbor in June 1864, Grant continued to exert relentless pressure on Lee. Finally, Lee was compelled to surrender his Confederate army to Grant at Appomattox Courthouse on April 9, 1865. After the Civil War, Grant was a national hero. He was elected to two terms as President of the United States and served from 1869 to 1877. Grant’s administration was plagued by corruption and political ineptitude. Suffering from throat cancer, Grant wrote his two-volume memoirs to provide income for his family after his death. He completed the work just before he died on June 23, 1885. Tags Abraham Lincoln, Appomattox, Army of Northern Virginia, Army of the Potomac, Confederate Army, Fort Donelson, Louisiana, Robert E. Lee, Shiloh, Ulysses S. Grant, Union Army, US Army, Vicksburg, West Point military academy, Western Theater.